Folding Kayaks Forum • View topic - Best Watch for Kayak? 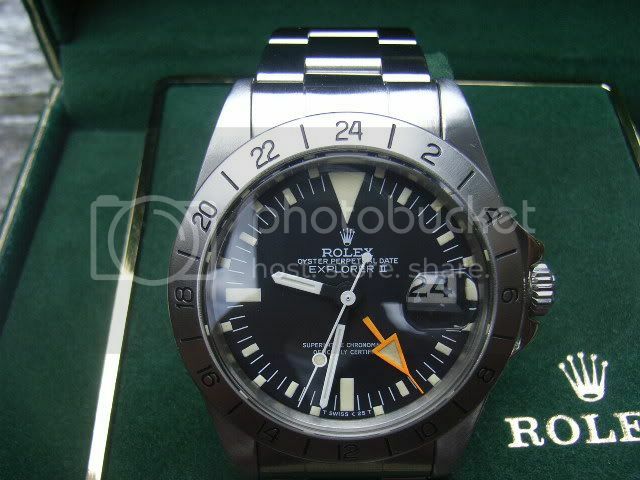 Post subject: Best Watch for Kayak? Can any one recommend a good watch for kayaking? I.e. Reliable, easy to read even at night, not to expensive, can strap to PFD or deck? Post subject: Re: Best Watch for Kayak? Asked this question at Paddlewise few years ago, only without the requirement of "not so expensive". So the answers included some $500 indestructible mechanical timepieces (analog dial) by renown companies. Not that I grudged $500 too much, but I don't like heavy metal cases and bracelets. Besides, analog dials either don't have alarm and calendar, or not fully automated (like 28/29 days in February etc), and mostly don't have a backlight (some are "luminous", meaning arms and numbers glow for a while after being exposed to light, but only for a while, and not as bright as real backlight). Have to note that my needs were more towards "expedition", i.e. calendar, alarm clock and backlight a must. On the other end of the scale were digital watches from Timex, Casio etc, with soft straps, calendar, alarm, timer (good for cooking) and 24 hour set up (i.e. 10 am is 10, 10 pm is 22) - military style, more convenient to me personally, though you may set it to 12-hour time, of course. Just look for 100m water immersion rating - this means it is submersible (and it really was, as I've found). But don't push your luck, - take it off when swimming. If you don't need alarm and calendar, you can probably get it with larger numbers (more room on display). Those with 50m rating or rated simply as "water resistant" are only good for occasional rain or splash, you don't want them. Watch out for those rated to 100 ft or 50 ft (50 meters is rain-proof, but 50 ft is probably good for nothing). Knock-offs made by unknown companies you also don't want - Timex is as low as I would go. 1) Cheap, cheap, cheap. Can be found under $25, even in quite expensive Canada. 3) Large numbers (some models have it larger, and some - smaller, as you'll see in store). You don't need large numbers on analog dial, but on analog dial the calendar will be tiny. 4) Very bright backlight (my particular model Timex Expedition Indiglo has bluish backlight, very bright). 5) Has all I need in overnight trips - calendar, alarm clock, kitchen timer. 6) With my particular buckle/Velcro closure it's easy to clip to anything - tent roof loop (though I put it in the tent pocket), D-ring inside the PFD pocket (though I keep it in zippered short pocket - it's waterproof anyway). 1) Don't last forever. 1st one died after 3 years. No I'm on my 2nd, 3 years and works, but backlight has died. I carry headlamp as my only camp light when it's dark, and it is always within my reach in a kayak (and I am not a night paddler - unless something goes wrong), so - no big deal. Still, - inconvenience. 2) Strap doesn't last forever too. No, mine didn't break, but it has a buckle/Velcro closure, and I had to replace that Velcro after 2 years. Well - I had time to mess with this, new strap can probably be installed. If you are not a multiday paddler type, and can do without calendar and alarm clock - good old analog dial with black arms and white background are easier to read in poor light conditions than digital watches, no matter how big numbers and how bright their backlight is. That is, - if you're OK with reading analog dial at all, - some people are not. Doesn't have to be mechanical or automatic-winding, - battery is OK, as long as it's waterproof. Prices are higher than digital waterproof. Sorry, can't suggest any. Have a feeling that those with battery will last same 3-4 years as $25 digital, and really good waterproof mechanical will cost $300 or more. Once again, - analog dial makes sense, IMO, only for better reading in dim light, and only with black arms and white dial. Casio makes diving analog dial watches under $100, on battery (so there is alarm and calendar), luminous arms (i.e. looking pale green in daylight, - not sure I'd like this). Thanks Alex for your detailed and considered reply. because the I already owned one, however it's performance has been dismal. watch face is poor, unusually unreadable after 30 minutes. I will try apply your collect wisdom and see what I can find. With this "Analog dial VS Digital display" thing - I really like white analog dials with black arms and black numbers. You can read the time on it until almost complete darkness, simply by position of arms, no need to discern the numbers. I only don't see any good waterproof one under $50 (even on batteries), and with kayaking there comes many other factors (beside wetness) that deter me from buying too expensive watch - strap opens and it dives, or button gets lost or even the watch itself - I lost even bigger items occasionally. OTH, digital watches like my Timex Expedition Indiglo have recessed buttons, and very bright backlight - but... you do need your second hand to make backlight work (though backlight button is huge and located on the front face), and on gray-green digital display you'll need a backlight in the evening pretty soon, when white analog dial could still be read without a backlight (i.e. without using your second hand). Not a big deal, though. Twilight is just a short period. Mostly you need a backlight after dark, and then you need some light to read a white analog dial as well. PS: this whole issue - white dial VS digital display - is more important for those wearing glasses, especially age-related problems with near sight (presbyopia). I'm one of them. Even though it's called "far-sightedness", both near and far vision usually deteriorate, so glasses are a often permanent fixture. On water I'm using "transition lens" (darkening when day is getting brighter), and they are not completely clear even under cloudy skies. Add some salt water drops (both on glasses and watch display), and as a result in cloudy day the backlight might be needed. And with digitals you still have to read those numbers, unlike on analog dial, where you only have to note the orientation of the watch arms - less accurate readings, but easier on eyes. I purchased a Casio Pathfinder PAW1300-3V last year. It's a typical gadget-filled ABC (altitude, barometer, compass) watch that has a good reputation as tough. I wouldn't depend on any of the functions for mico-measurements or navigating but for relative functions, I found it was useful. Keeping an eye on the barometer graph was interesting during the AL trip - the pressure dropping helped me keep an eye out for afternoon thunderstorms. At night, the light comes on when you bring your wrist up to read it. The numbers are large enough that my 50+ eyes can read them w/o glasses - if I hold it close enough to my face. It's also the watch of choice when I travel out of the US - at less than $200, I don't have to worry so much about being robbed of it. Hello Gerry, thanks for the info and the link to the review. TAD biggish, though. I read some reviews, - one guy said: " ...the only thing is doesn't have is GPS". No kidding - everything else it does have. Well, I have a separate GPS anyway (and this GPS has a barometer, altimeter, compass, and I also carry a small $9 compass, accurate enough for my navigation purposes, and often better than the one in GPS). Not sure why they call it "full-size" - it doesn't look any bigger than regular watch. Display is big, though. Don't know about its backlight - this is not "Indiglo" like in my Timex (green when not lit and bright-blue when lit). This one is white when not lit. Nothing fancy, just regular features - alarm, stop-watch, calendar, 100 meters immersion. TAD costly at $CAD 65 ($US 50) - probably can be found under $US 40 elsewhere (or a similar model). Where are you located Tim? The Casio is a 5 multi-band (U.S., United Kingdom, Germany, 2 locations for Japan) & I don't think there's anything better on the market and with the shortwave signals you shouldn't have any issues. Besides, it's not like the watch will need resetting anyways - it's quartz-accurate. Alex - yep - it's a tad large but even with my wrists, it's not an issue. It wears well. My only knock is that it doesn't wear well on a NATO-strap due to the lug-design. I'm kind of a watchnut - I think I've sold three or four this year to reduce the number owned. My favorite daily beater is an O&W ID 3066 which has a generic ETA movement. The O&W's were popular during Vietnam - Mr. Wajs is still alive and is now in his late 80's I believe. The one above is about a $1000 or so. Bill has an excellent reputation by the way. Did I mention that I like watches??? By the way, I wander which one you will be wearing on our camping trip to Canyon Lake. Soon my dear wife and I again will be zooming on I-5 towards Apache Junction for the winter, K-I and camping equipment with me. Marschall from Phoenix with his Mark I already indicated that he's ready and waiting. Tentative date for the trip is mid-January. Will posts details once there. Hello Gerry, I'm located in Victoria Australia. unlatching when you least expect it. How do you find the trilux luminescence on the Ball timepiece? rather than watches. I was looking a the Classic Chrono . Thanks for the info and some pointers to some nice watches. Tim, shedding buttons is more often a problem with mechanical timepieces (or those looking like mechanical, with arms) than with digital ones. I had never lost any buttons off my current $CAD 30 or $40 Timex (don't remember the price paid years ago) or its similar predecessor (lost to high tide). Buttons are almost flush with the case, offset just enough to provide a contact with finger tips, but not enough to bend or otherwise damage it. There are some models under $CAD 30 (including reputable digital brands as well), which I wouldn't recommend as they do not specify water immersion rate, and their buttons are more prone to damage. What is atomic illumination, btw? Hello Alm, I was probably being a bit over dramatic with the atomic illumination reference. I've heard it called Trilux and often referred to as gaseous tritium light source or a trigalight. Also can get map readers, tactical torches and marker lights as used by the military. Another detail is that it lasts for 10-12 years. OK, my Timex doesn't look like will last more than 5 years (lost its backlight after 2 years), but 5 times @ $30 (with 2-2.5 years of proper functioning) still sounds better than Ball to me. Not to mention the possibility of physical loss of timepiece, of course. My pleasure. I like my Pathfinder - a lot. Great watch, excellent features and pretty darn tough. I suspect it'll update from the Japan signal. I'm not sure what the output is from the Japan radio system but I know I've worked Japan via HF plenty of times on 20-watts. You should be fine if you select the Pathfinder. The light on the Ball is pretty bright - and continuous. You don't have to charge it either. I hear you Alm - I could never make an economic case for the Ball - it'll last quite a few years and I like it. As I've found, everyone has something that they don't mind spending a little extra on - mine is watches and kayaking. I've already lost the Ball in 30-ft of water at Mission Bay when the band proved weaker than the wetsuit's power as I pulled it off at the dock. It took only a little effort to recover it that involved a throw bag weighted down with a brick to help mark the spot. At this rate, it'll take me a few years to save enough. The coating is DLC - diamond-like carbon - is a matter of personal taste. Jack, who runs International Watch Works, did the coating on this example and does a very good job if you ever need a watch repaired. I sent him my O&W and he diagnoised the problem and ordered the parts within four hours of receiving the watch. I asked him to beadblast the case while he has it to remove the shine. I am a amatuer WIS - watch idiot savant. unobtainable I ended up getting a Casio Titanium Sea Pathfinder.